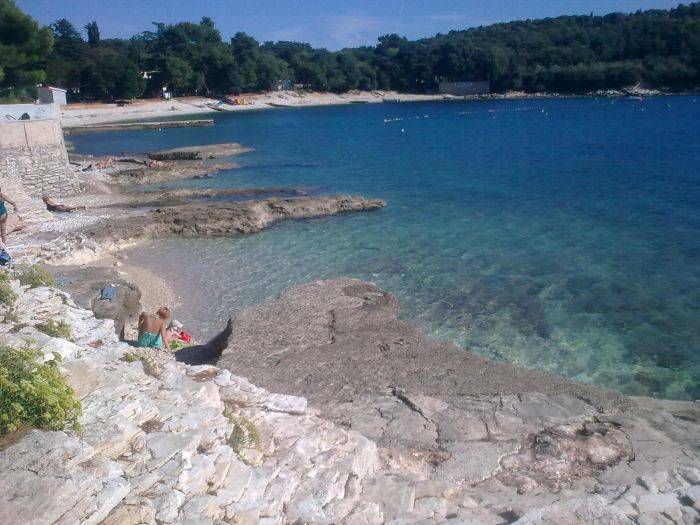 Banjole is a resort which is 5 km far from Pula, located on a little peninsula surrounded by a luxuriant pine-wood forest that fall over the sea. Along the indented and varied Banjole coastline hidden amidst lush vegetation offering welcome shade during the summer heat. 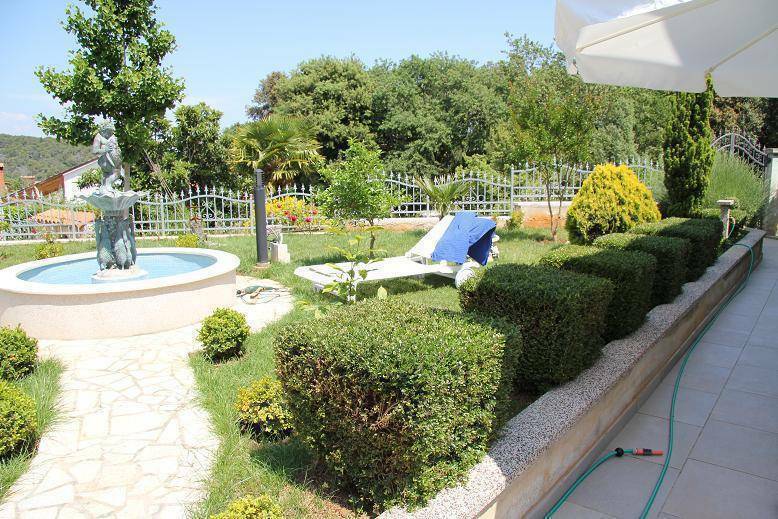 The Holiday Home is on the ground floor surrounded with view of garden and well maintained. The walking distance to the nearest rocky and pebble beach is approximately 700m and to the town centre is approximately 500m. Although Banjole is considered to be a little Fishing Village, there are amenities like restaurants & bars, pharmacy, grocery stores, diving centre and bike rentals. For sportsmen and recreationists, there is one football field, four tennis courts and two private clinics in any case of emergency. The landlord can converse in German, English and Italian. He lives at the same premise and reachable in case any issues arises. Studio for 2 People A cozy living-room with Double bed, SAT-TV, Free Internet WiFi connection, an equipped kitchen and a bathroom. The Studio-apt. is located on the ground floor with covered Terrace and garden view. Floor area above 35 m², Parking in front of the house. Equipped by Central Heating, Satellite TV, A/C climate control, Kitchen utensils and tableware according to the number of persons, Refrigerator, Microwave oven, Coffee maker, Grill, (Washing machine, Iron, Hairdryer at request). Cleaning in every change of guests. 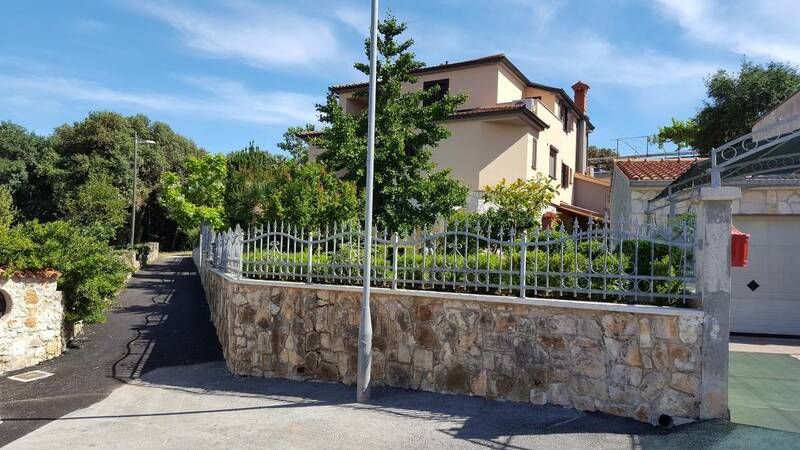 Garden around the House with 500 m2 fenced Our House is situated in the small fishing village at Pula, where you can spend your holidays with natural experiences, relaxation and fun. Our apartments are furnished with taste, nothing will be missing, there is a harmonious and peaceful environment. From spring till autumn you will live in a paradise for excursions and hiking trips or for example, you can take advantage of daily transit ferries to Venice or Brioni Islands. A variety of culinary specialties of land and sea, with a wide choice of restaurants and taverns you will find within a radius of 500 metres away. . We look forward to your visiting! Apartment for 3-4 People Two decorated cozy rooms, sleeping room with double bed and living-sleeping room with two single beds, fully equipped kitchenette and dining area one bathroom with SAT-TV, Free internet WiFi connection, A/C climate control. The apartment is located on the ground floor with covered Terrace and garden view. Floor area above 48 m², Parking in front of the house. Equipped by Central Heating, Satellite TV, Kitchen utensils and tableware according to the number of persons, Refrigerator, Microwave oven, Coffee maker, Grill, (Washing machine, Iron, Hairdryer (at request). Cleaning in every change of guests. 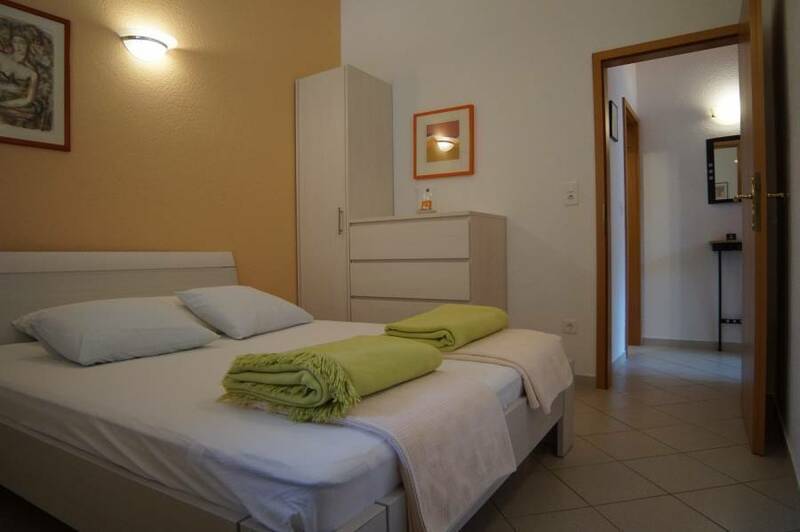 The holiday apartments are located in a small croatian town in southern Istria. Banjole is immersed in lush green of nature and pine trees. The town is known for its abundant choices in outdoor activities and gourmets. Swaying pine trees, crystal blue sea offer an amazing relaxation away from urban living. Not too far from Ginkgo Apartments is the old ancient city of Pula. The epic city centre unveils beautiful architectural buildings that numerous visitors from all over the world tend to admire. A melting pot of different cultures enhances the aspect of the city and its history. 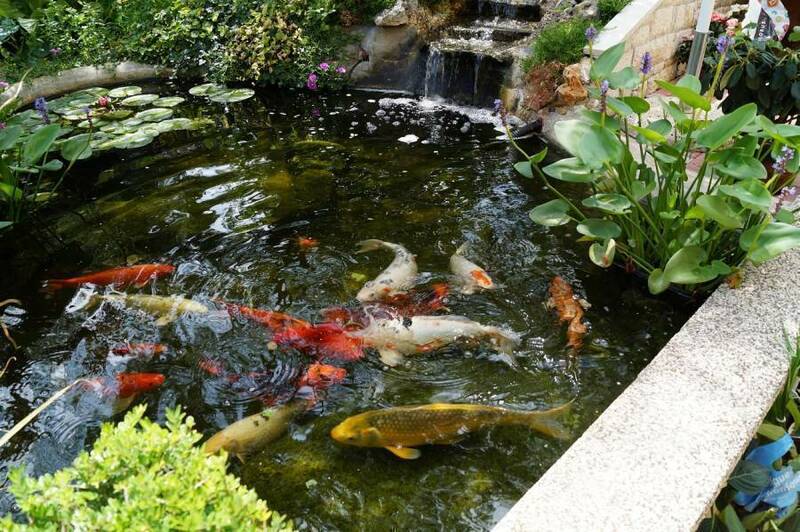 The apartments are on the ground floor overlooking a beautiful garden. 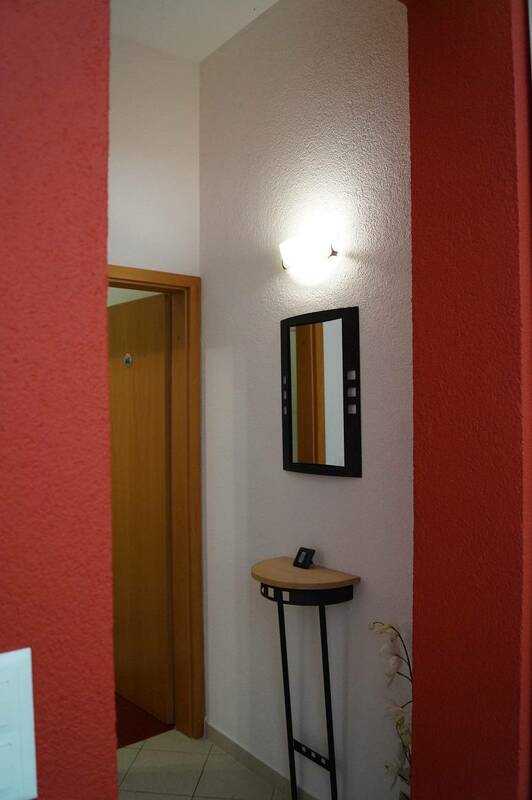 Decorated with modern interior design that will make our guests feel very welcomed like at home. Especially in the early morning hours our guests will be pleased to enjoy breakfast at the terrace with a great atmosphere of the surroundings. ​ We look forward to welcome you in Banjole ! Apartment for 4 People Two decorated cozy rooms, sleeping room with double bed and living-sleeping room with two single beds, fully equipped kitchenette and dining area one bathroom with SAT-TV, Free WiFi internet connection, A/C climate control. The apartment is located on the ground floor with covered Terrace and garden view. Floor area above 52 m², Parking in front of the house. Equipped by Central Heating, Satellite TV, Kitchen utensils and tableware according to the number of persons, Refrigerator, Microwave oven, Coffee maker, Grill, (Washing machine, Iron, Hairdryer (at request). Cleaning in every change of guests. The holiday apartments are located in a small croatian town in southern Istria. Banjole is immersed in lush green of nature and pine trees. The town is known for its abundant choices in outdoor activities and gourmets. Swaying pine trees, crystal blue sea offer an amazing relaxation away from urban living. Not too far from Ginkgo Apartments is the old ancient city of Pula. The epic city centre unveils beautiful architectural buildings that numerous visitors from all over the world tend to admire. A melting pot of different cultures enhances the aspect of the city and its history. The apartments are on the ground floor overlooking a beautiful garden. Decorated with modern interior design that will make our guests feel very welcomed like at home. Especially in the early morning hours our guests will be pleased to enjoy breakfast at the terrace with a great atmosphere of the surroundings. ​ We look forward to welcome you in Banjole ! A/C climate control Coffee/tea maker Fax machine Fax service Fax service at request Free ADSL wireless internet network connection Hairdryer at request Iron at request Kitchenettes Lockers Microwave Private bathroom Refrigerator Showers without bath Television Television (cable/satellite) WIFI Washing machine at request. The region is one of the greenest and the largest peninsula in Croatia, located not too far from Rovinj and Venice on the very west part of Croatia. It's a very popular destination for tourist and travellers due to it's close vicinity to Italy, Slovenia and Austria, as well as it's large coastline, full of small and larger bays with hundred of places and villages offering tourist services. The interior of the Istrian peninsula is also very attractive, with numerous small towns built on top of the hills around the region. Once upon a time, Istria was called " Terra Magica" (The magic land). You will experience centuries-long Arcadia of the Istrian peninsula, its towns with vivid history, romantic churches, gothic and baroque villas, medieval towers and fortifications. Explore woods, valleys and hill slopes with hill-forts and bell towers as well as worldly renowned vineyards. The soil is ideal for grape cultivation and it is the location of “The drink of gods”, well known Istrian wine of unique bouquet. Tour around the castle and Ethnographic Museum in the town of Pazin reveal an impressive view on heritage, arms and ceramics, significant for life in the Region throughout the centuries! ADDITIONAL COSTS PAYABLE AT ARRIVAL AT THE RENTER. ZUSATZINFORMATIOEN ZU DEN MIETPREISEN ZAHLBAR BEI ANKUNFT. ULTERIORI INFORMATIONI SUL PREZZO D'AFFITTO PAGABILE SUL POSTO. Once in Pula, do not enter the city centre, follow the signs to Medulin and move towards Premantura, continue until the exit for Banjole. In Banjole you will reach us after circa 1 Km, till to the Area "Kaštanjež"
and turn right to Kaštanjež 9-27 at Number 16a.